Whey Protein Powder– This is the core of the shake and will provide the bulk of the protein for the muscle building. Buying a large wholesale-sized container would not be a bad decision for this particular ingredient. This will go into every shake. Fortunately, this itself comes in a large variety of flavors so that alone helps to vary up the flavor of the shakes. Greek Yogurt or Cottage Cheese– For adding a creamier texture to the shake either Greek Yogurt or Cottage Cheese can be used. They both have low sugar and high protein. Avoid regular yogurt as that has a much higher sugar content which is as mentioned above something to avoid. Fruits– Bananas and Berries are a great addition to the shake. 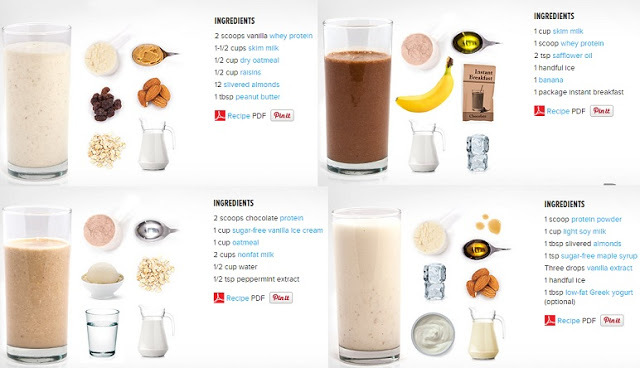 Both provide a lot of texture and flavor to the shake making more than just a drink one has to drink. Beyond that the Bananas provide a lot of potassium which helps to build muscles, while the berries are full of many different vitamins and antioxidants. For the berries simply use a frozen bag of berries from a local supermarket to reduce the amount of unnecessary extra work. Dry Ground-up Oats– To prep for the next work out add some dry ground-up oats to the shake for the carbohydrate content. They will work well in the blend and not really be noticeable. Natural Nut Butter– A quick way to add some healthy fats to the shake is through natural nut butters like peanut butter or almond butter. However, avoid the cheap ones and go of the nut butters that only list ingredients like “peanuts” or “almonds”. Avoid anything with “hydrogenated oils” in them, as those are the bad fats. Dried Coconut– For some variation in flavor and an extra energy boost dried coconut is an excellent ingredient. It is very calorie dense as well. Xantham Gum– To adjust the texture of the shake add Xantham gum which is something also used in ice cream. This is purely to change the thickness of the shake to suit the palette.